ALL members must REENROLL for after-school program each school year. We require a $40 payment for the months of Aug and Sept to secure your child’s spot. Step 1: Find your child’s school to determine which club you will need to bring your application. Step 2: Download the application and fill it out and bring it to the club along with your payment. *All spots are filled on a first-come, first-served basis regardless of prior year B&G Club membership…if a van route is already full, your child will be put on the waiting list. **NO SAMEDAY REGISTRATION – if your child is not registered BEFORE the first day of school, they will not be able to attend the club the first day. 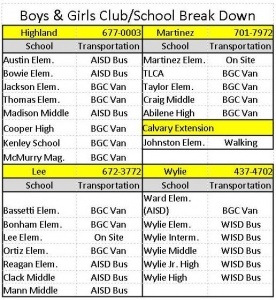 The Clubs are opened on any day the Abilene and Wylie Independent School Districts are opened. Clubs are opened at 3 p.m. and close at 7 p.m. with the exception of our faith based sites that close at 6 p.m.
Our clubs are open to all young people between the ages of 6-18. Clubs are open daily during the schools year and membership entitles you to be involved in as many Club activities as you would like! Each club has a membership fee of $280 per year if you pay by the month at $30 a month, but NO CHILD IS EVER TURNED AWAY for being unable to pay. Scholarships are available. Fill out an application form and bring the appropriate financial information. You can get a month for free if you pay up front which takes your $280 to $250. 1. Click on this link to Download and Print the membership form. Our summer program is held at the Nelson Club. Summer rates are $25 a week per child. Summer programming offers fun, safe activities for your children including computer, art, gym, and game room activities. Daily field trips are available for a minimal cost. Summer sessions are Monday-Friday, 7:30 a.m. to 5:30 p.m. Breakfast and Lunch are provided. Teen Night is held at our Nelson Club on Tuesday, Thursday, and Friday nights. Teen Night starts at 7 p.m. and ends at 10 p.m. on Tuesday and Thursday and closes at 12 midnight on Friday nights. Teen Night is FREE! Please click on the link below to view and print the membership application needed for enrollment.